The purpose of the SMD Soldering Challenge is to provide people the opportunity to get some experience with smaller surface mount devices, so as to decide for themselves how small a part they feel comfortable working with on future projects. Since there are significant cost benefits with quantity, I decided to buy enough parts for 100 "kits", each of which contains a sample of many tiny SMD parts, and sell the kits for cost(ish). The schematics and layout were done with gEDA and PCB. 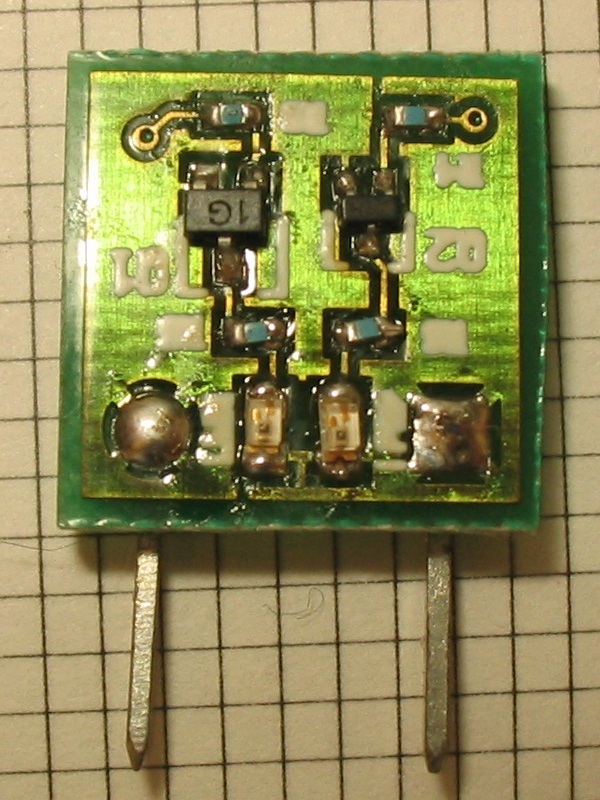 Note: the purpose of this kit is the soldering, not the results. I designed a circuit that happens to work if all goes well, but I don't guarantee it. There are all sorts of things that can go wrong from the time the parts get here (my house) to the time you finish the circuit. Note that for each oscillator, only one of the two capacitors is to be populated. C4/C5 results in about 400Hz, C2/C3 results in about 2200Hz. 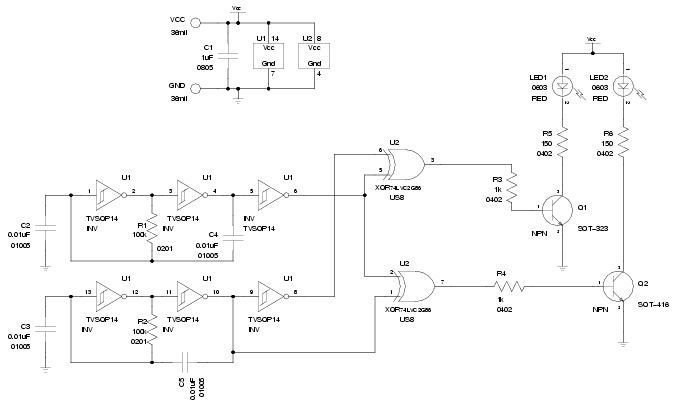 This circuit is sensistive to injection locking, hence the alternatives. 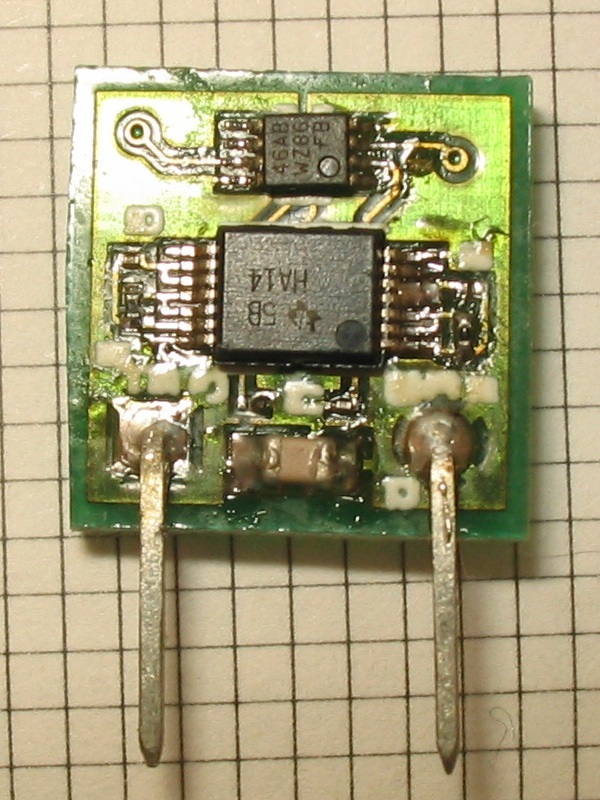 Also, R5 and R6 may be populated with 1k resistors instead of the 150s. Note: You only populate C2 or C4, but not both. You only populate C3 or C5, but not both. Note: there are two extra 1k resistors. R5-6 can optionally be 1k, they're just current limiters for the LEDs. You'll have two 0402s left over after you build the board.